An epilator is essentially a device that removes the hair from its roots. The Braun 5280 Silk Epil 5 Epilator is great alternative from the traditional depilatory methods of tweezing, waxing, and shaving. Millions of women all over the world love smooth and silky legs, but they often have problems with the hair (sometimes, even coarse ones) that grow around that area. The Braun 5280 Silk Epil 5 Epilator is a great way to make the most of your legs especially during the summer season—this specially designed device will gently remove the hair on your legs right at the roots so that the skin will stay smooth and silky for weeks at a time. The Braun 5280 Silk Epil 5 Epilator is also one of the most cost-efficient ways to get smooth and silky legs. It is definitely hundreds of dollars cheaper than most of the home hair removal treatment devices in the market. But what are the things that can make this system indispensable for you? Let’s find out. What Is The Braun 5280 Silk Epil 5 Epilator? As mentioned earlier, the Braun 5280 Silk Epil 5 Epilator is a device that pulls out hair gently from your legs. One of the reasons why it is incredibly painful to wax your legs is that there are plenty of nerve endings in the area. When done incorrectly, hair-pulling and removing in that area cause pain that can last for hours. 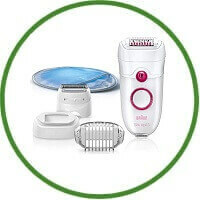 What makes the Braun 5280 Silk Epil 5 Epilator work is the epilation head, which features forty tweezers that can significantly remove more hair in a single stroke compared to the other epilators that you can find in the market. These tweezers are coupled with active massaging rollers that stimulate the skin during the process—right before and after the hair is removed to minimize the painful pulling sensation. The Braun 5280 Silk Epil 5 Epilator system comes with an ice glove that effectively cools the skin before the epilation process, which makes for a less painful experience. What Are The Advantages Of The Braun 5280 Silk Epil 5 Epilator? The Braun 5280 Silk Epil 5 Epilator offers the convenience of shaving but gets much more hair out of the way. While shaving just cuts off the hair at the surface, an epilator pulls the hair from the root, which allows you to enjoy weeks and weeks of smooth and healthy legs. Another unique advantage of the Braun 5280 Silk Epil 5 Epilator is that it includes SoftLift tips that raise flattened hairs to remove them—even those strands that are only half of a millimetre long, which waxing cannot remove. The cooling glove that comes with the device gently cools and soothes the skin during the epilation process to minimize any discomfort that you might feel while using the Braun 5280 Silk Epil 5 Epilator. What Are Customers Saying About The Braun 5280 Silk Epil 5 Epilator? “Good, because my legs were smooth for a week before I felt anything growing back. And good because that pain means fewer razor cuts and less money spent on razor blades.” – K. Kasabian, Amazon.com “I’m giving the Braun SE 5280 Silk Epil 5 four stars, because it did get better with practice and patience, and even if it isn’t perfect, it beats shaving my legs any day.” – Michael Jandrok, Amazon.com “I was heartbroken when my old Silk Epil broke, but after trying this one, I could not believe how much the technology has improved. It gives perfect results in a fraction of the time and is not as painful as the last one.” – Liz, Amazon.com What Is Our Verdict? Although tweezing hair off is very painful, the Braun 5280 Silk Epil 5 Epilator makes the tweezing experience a whole lot gentler and efficient. If you do not want to pay thousands of dollars for laser hair removal and electrolysis treatments, then this product just might be the hair removal solution that you are looking for. The Braun 5280 Silk Epil 5 Epilator really is better than shaving your legs every day.